This is about the healthiest bowl of awesome ever. Once you skim the fat off the broth. 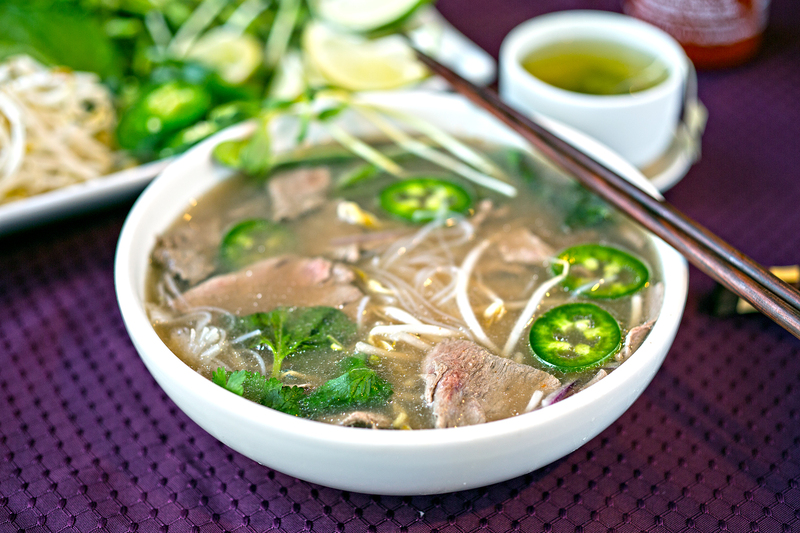 Pho was for a long time uncharted territory for me; something I would never try to make on my own. 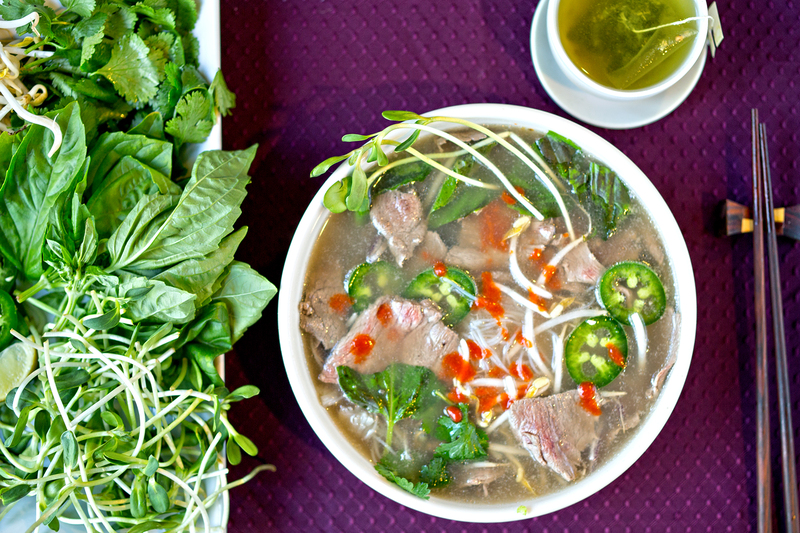 It represented a delicious bowl of mystery that could clearly only be unlocked by world’s Vietnamese cooks. Like a secret that I could never know, thus never wanted to know. Then I ended up with some beef knuckle bones collecting freezer burn in my deep freezer. The natural thing to do with such a thing is to make broth. However, if I’m gonna go to the trouble of making beef broth, why not take it up a notch and make homemade pho? It’s actually surprisingly easy to make, and you can start with store-bought beef broth if you don’t have or want to procure knuckle bones, or if you simply don’t have 3 hours to hang out while it stews. I’m sure there are numerous variations out there, but the basic additions include coriander seed, anise star, ginger, cinnamon sticks. Boil all that in the broth for about a half hour while you prep everything else, strain through a sieve and you have pho broth before you can even say wham, bam and thank you, ma’am. If you do decide to make broth from beef knuckle bones, or any beef bones, it’s important to account for the time it will take to cool in the fridge to let the fat lift to the top so you can scrape it off. Now don’t get me wrong; as much as I love a healthy bowl of soup I’m not opposed to having fat in there, however, there was so much fat in it that the broth was slick. It was like a bowl of oil. If you decide to use venison bones, use your best judgement. You’ll probably end up with some fat from the marrow, but probably not enough to really worry about. The only other piece of advice is to slice your meat paper thin, as it only cooks in the warm broth as you add it to the bowl. Slicing the meat slightly frozen is helpful, and, of course, having a really sharp knife. The best part of this is that once you have your broth made, it’s incredibly quick to throw together. Heat a soup pot over medium heat. Add the spices and heat until fragrant. Then add the broth and ginger. If using bones, bring to a boil and simmer about 4-ish hours. If using broth, simmer while prepping the other ingredients, about 30 minutes. Cook the rice stick according to package directions. (Boil water, add rice stick, take off heat and let sit for 10 minutes. Drain and reserve until ready for the soup.) Meanwhile, slice your meat and prep all of your garnishes. When everything is ready, place a serving of noodles in a bowl and top with the thinly sliced onion and venison. Pour the broth through a sieve into the bowl (the hot broth will cook the meat) and garnish with herbs, bean sprouts, siracha and hoisin. Non Game Substitution: You can use anything that can be thinly sliced, from beef tenderloin to a filet if you really want to. You can also add brisket. Vegetarian Substitution: Throw in a few extra vegetables (like carrot, cabbage or broccoli) and some firm tofu and you’re good to go.